One of the most difficult tasks for an established band is following-up a successful debut. The task at hand has resulted in many a failure, as artists choke under pressure and fail to capitalize on their promising foundations, buckling under the increased expectation from the record label and swelling fan-base. A follow-up of any sort didn’t seem a certain prospect for UK’s doomers, Age of Taurus. The band’s 2013 LP Desperate Souls of Tortured Times, was a captivating debut, built on a slightly modernized, traditional doom foundation of robust, ironclad riffage and generous hooks, shrouded in a laid-back but heavy stoner fog. 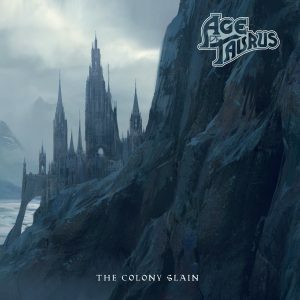 Finally Age of Taurus return with their long gestating sophomore opus, The Colony Slain. There’s little surprise after such a lengthy break and a couple of line-up changes that The Colony Slain doesn’t follow the engaging template from their debut too closely. Instead Age of Taurus unsheath their swords and chart a battle hardened path of epic, traditional doom, imbued with a galloping, classic heavy metal spirit. There’s enough here musically to link the album to the debut, but The Colony Slain marks a considerable shift in direction. Sometimes the shift sounds a little jarring but mostly the band pull it off successfully, revealing an emotional depth and complexity to complement a bevy of great riffs, stirring harmonies and hooky vocal melodies. 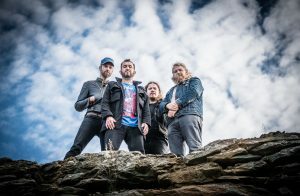 Steel-plated doom remains at the core of the Age of Taurus sound, but extra embellishments and stylistic deviations cultivate healthy dynamics to the band’s song-writing. And the songs themselves are never less than solid. “In Dreams We Die” is a fine example of the epic guts and glory approach Age of Taurus deploy, structured around tight riffs, thick, bass-heavy grooves and passionate vocal power-plays. After a beautifully restrained clean section, the song kicks it up a notch as the vocals and tempo gathers momentum and terrifically expressive solos seal the deal. The cold, mournful tone, crunchy riffage and multi-faceted vocals on “The Trial of Blackwynn Chaise” works a treat, including a surprising turn from guest vocalist Chantal Brown. Main man Toby Wright (vocals/guitar) utilizes the refined and relaxed clean croon that served him well on the debut, workingwell within his rather limited vocal abilities. It may not work for listeners expecting a more forceful, gritty and commanding performance, but there’s something so likable and endearing about his laid-back style, and the strong melodies contained within, to overlook their shortcomings. Once more, Wright mixes up his delivery to match the more energetic and dynamic directions the band has taken musically. He uses gruffer and more aggressive variations, especially as the tempos ratchet up, like the glorious riffage and triumphant change-ups on the doomy and melancholic, “The Lost Garrison.” Occasionally these vocal variations miss the mark and come across a bit goofy, but mostly work in the album’s favor. Lyrically the album forms a continuation of the band’s ongoing concept of The Taurean Empire and its medieval tales of war, treason, heroism and deception, well conveyed through the tone and darker vibe of the material, and Wright’s passionate storytelling. The dual guitar work is a constant highlight and clear strength to the album’s construction. New guitarist Daniel Knight combines fluidly with Wright, the duo adding a significant NWOBHM influence into their weighty doom stew, resulting in a stately, powerful and dynamic performance. Not to be overlooked, the rhythm section holds down a mighty foundation, blending pure force with tasteful creativity. As consistently very good to great as the bulk of The Colony Slain proves to be, I do find myself missing the fat, slightly unrefined charms and Candlemass worship of the debut. But I can’t really fault a lot of what Age of Taurus have created here, if not being quite as enamored with the album as its predecessor. Initial disappointment, mainly due to my inflated expectations and reservations about their shift of direction, have gradually dissipated and The Colony Slain is a fine progression and follow-up to the great debut. It’s a classy, sword wielding doom opus with huge riffs, memorable song-writing and vocal melodies that worm their way into your brain, tied together with rich, punchy production. Age of Taurus took their sweet arse time, but have crafted a solid album worthy of attention from doom fans old and new.